A couple of days before this year’s annual boat race between Oxford and Cambridge, I found myself on a floating hotel on the Thames witnessing a launch event sponsored by a bunch of drinks brands. 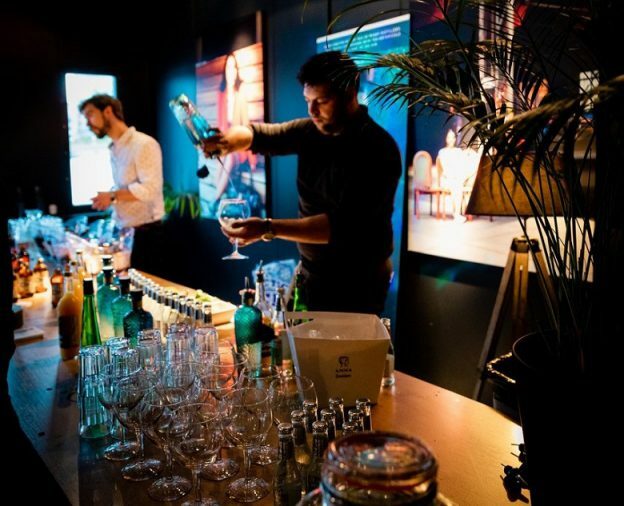 But this was no ordinary hotel, no ordinary launch and no ordinary drinks brands. This was sustainability with bells on! It was in fact the official launch of In The Drink, a not-for-profit initiative to rid the River Thames of plastic waste. In The Drink were instrumental in helping a local enterprise invest in 14,000 reusable plastic cups to be shared among eight pubs, preventing 50,000 single-use plastic cups ending up in the river or heading for landfill in just one day during the boat race. The launch was held at the Good Hotel, a social enterprise providing job opportunities to long-term unemployed people in the area. One of the ethical drinks companies sponsoring the event was Mermaid Gin from the Isle of Wight, who design their packaging to be plastic-free and 100% recyclable, right down to the biodegradable paint, all-natural cork with a wooden top and a paper seal instead of plastic. Mermaid kindly paid my expenses to attend the launch. The other two drinks companies supporting the event were Cotchel who make juice from unwanted fruit in an effort to make their farm more sustainable, and Small Beer Brew Co. who practice dry floor brewing using just 1.5pints of water instead of the usual 10pints to produce just a single pint of beer. The room was brimming with people passionately engaged to provide practical, ethical solutions through their work, their businesses and their networks. The people behind In The Drink are the founder of Ally Bee, an ethical clothing brand; Active360, a paddleboarding company with strong environmental engagement; Anti-Plastic People, a community interest company; and registered charity, Thames21. Suffice it to say that there was a real sense of people working together and achieving tangible results that legislation or regulation would just take forever to achieve. I chatted to Xavier from Mermaid Gin who created the brand together with his long-time friend Conrad. Clearly proud of their hand-crafted, small batch gin which is distilled using ethically-sourced botanicals and even rock samphire foraged from the Isle of Wight’s cliffs, he acknowledged the huge supply-chain challenges and the immense effort they had to put into every detail of this project. The distillery asked all its suppliers to stop the use of bubble wrap and to source alternatives at every stage of the production and distribution process. This is why we need to source our food and drink, including our gin, from producers who are brave enough to put their money where their mouth is. I salute you Mermaid men and women! Circular Economy – what is it? This entry was posted in Food shopping, General on April 16, 2019 by admin.